Not your father’s recliner, the Gulfbay Brown rocker recliner brilliantly showcases the next generation of recline design. 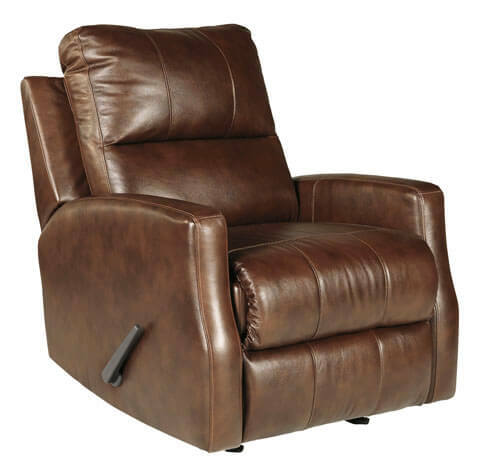 Sporting sleek lines, cool curves and a less-is-more aesthetic, this wonderfully contemporary recliner in rich charcoal grey or Canyon Brown spoils the senses with a luxurious leather seating area for indulgence from head to toe. Frame constructions have been rigorously tested to simulate the home and transportation environments for improved durability. Components are secured with combinations of glue, blocks, interlocking panels and staples. Stripes and patterns are match cut. All fabrics are pre-approved for wearability and durability against AHFA standards. Cushions are constructed of low melt fiber wrapped over high quality foam. Features metal drop-in unitized seat box for strength and durability. All metal construction to the floor for strength and durability. The reclining mechanism features infinite positions for comfort. 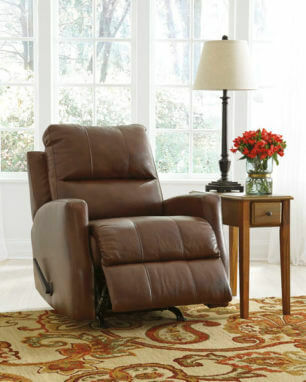 Upholstery features top-grain leather in the seating areas with skillfully matched DuraBlend® upholstery everywhere else.